Milgard Invitational Case Competition on Social Responsibility at University of Washington, Tacoma, United States of America, this is the first year we were invited as an international team joining MICCSR. 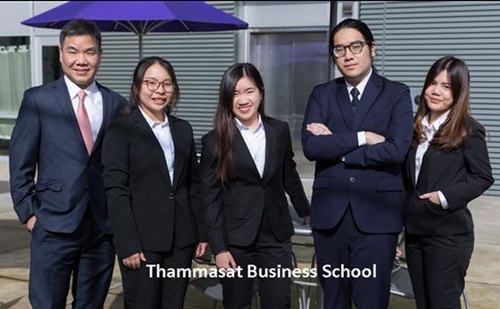 This year, Thammasat Business School has sent 4 representatives, including Araya T. (BBA #23), Pasinee H. (BBA #25), Paruda (IBMP), and Nitis (IBMP) accompanied with Dr. Worapong Janyangyuen as the advisor. We started with our 72-hour case, it was about Microsoft and technology that we will face in the future. The problem to be solved is what Microsoft should create platform to handle upcoming situation of technological advancement. After we have done the case, we took a long journey all the way to UW. As we arrived at Seattle-Tacoma Airport in the morning of 27th of February, the organizing committee of MICCSR had us a warm welcome at the airport, took up to the hotel and took us a tour around the campus. On our first day at the competition, the committee took us to downtown Seattle and explored an adventurous city as well as Museum of flight. The competition format was for teams to complete a case with 72-hour case in Thailand, and present at UWT. We had a 15 minutes� presentation alone with 10 minutes Q&A. Thammasat University was placed into division A, along with Georgetown University, University of Southern California, and The Florida State University. Although the result was not as we expected, the team learnt various lessons along the case preparation and feedbacks received from an honorable panel of jedges. In addition, we would like to espress our greatest gratitude for the MICCSR committee, BBA program, and all of case team advisors, notable Ajarn Somboon Kulvisaechana, Ajarn Supawat Likittanawong, Dr. Worapong Janyangyuen, Dr. Nopporn Ruangwanit, and Asst.Prof. Dr. Orapan Yolrabil for your guidance and training. All in all, MICCSR was an experience that will long be treasured in our memories.